The Susan G. Komen® Global Research Program funds lifesaving research in all areas of breast cancer, from basic biology and prevention to treatment and survivorship in the United States and across the globe. Every year, twenty-five (25%) of the funds Affiliates raise from community supporters goes directly to support life-saving research. Since 1982, Komen Affiliates have funded over $920 million to Susan G. Komen’s Global Research Program. Since our inception in 2005, Komen Central and South Jersey has provided over $5.7 million to support breast cancer research. This year we invested $257,560. 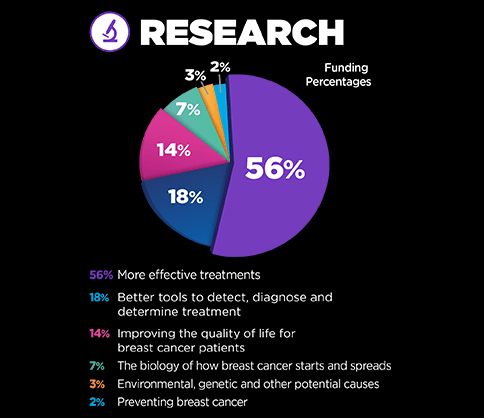 Click on the graphic below to learn more about Susan G. Komen’s overall 2018-19 research investment.